I know it's a little late, but Merry Belated Christmas to all those who celebrate, and Happy Holidays to everyone! I hope you all are having a wonderful holiday and enjoying the super cold weather (or warm, if you're lucky)! I am such a procrastinator that I actually did my Christmas nails on the day of, while we had family over! I wanted to do something simple using little to no brain power...so I literally just googled 'christmas nails' and chose the cutest design I could find! It was featured on a ton of different websites, but it is still such a simple and perfect design for Christmas. 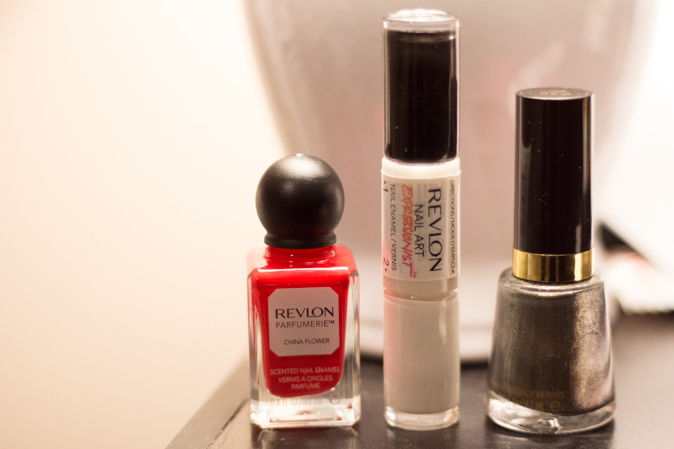 All of the polishes I used were from different Revlon collections. I used one coat of Revlon Parfumerie China Flower on the entire nail. 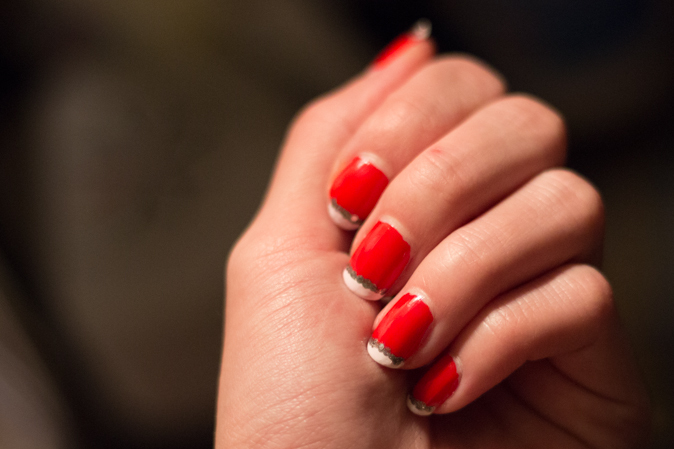 Then went over the tips with a white polish (Night & Degas). And used a dotting tool (since I didn't have a thin brush) to line Revlon Rich, which is a silver, in between the red and white. 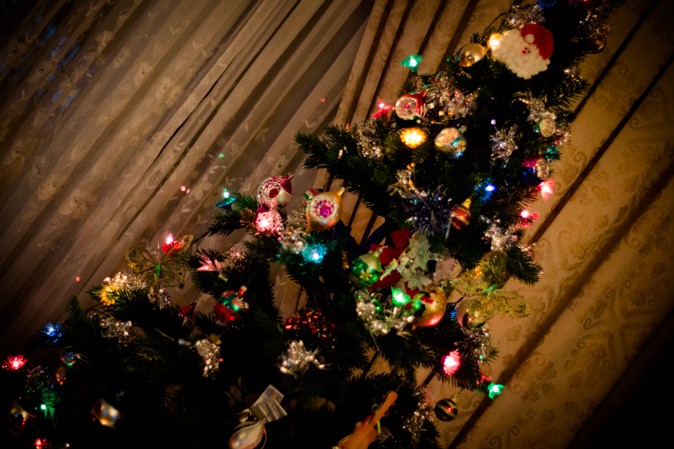 Also, I wanted to share our lovely tree! Don't hate on the minimal decorations! My grandma originally didn't want to put up a tree, and seemed a little angry when I mentioned it. A few days later I came home to them setting up the tree and decorating without me!! All in all, I am happy that we did get one up this year, although she does get a little possessive when it comes to who gets to decorate the tree, so I let her do most of the work. I spent Christmas with my family at home, and my dad, stepmom, her father, and my stepbrother came over to celebrate with us. It was nice since I haven't seen them in quite a while and I was happy that everything went well! 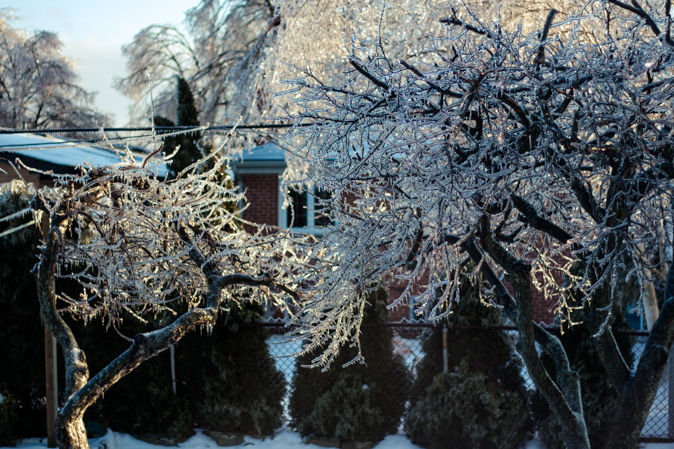 And the infamous Toronto Ice Storm 2013, also known as #darkTO since it put over 250,000 of us out of power last Sunday! My grandparents were out only for about 13 hours but many people and friends were unlucky and had a power outage for up to 8 days. My bf got his power back on 5 days later on Boxing Day! I'm following @TorontoHydro on Twitter and 9 days later they are down to fixing the remaining 400 customers, yay! Above is a shot through a window in my house, it was just too cold to take my camera outside! Did any of you in Toronto lose power, and how did you cope!? I couldn't believe how cold it could get without power! My bf's house was almost at 0℃ on Wednesday! For Christmas I did end up getting the CHI Elite Gold Rush Flat Iron that I wished for in My Christmas Wish List: Fashion Edition from my bf! :) I mainly received money, so I can buy my own presents, because everyone knows how extremely picky I am...What did you all get for Christmas? Disclaimer: I was sent products in this post for consideration, but it was completely coincidence that I ended up using all Revlon polishes for this NOTD!